Following this year's crazy and combative presidential campaign has made me wonder when public relations first became crucial in politics. The advertising that most of the candidate use consists of innuendos and outright lies about opponents. Very little form and substance. In particular, I've been following the money that is being poured into the political arena to influence the average voter. Check this out: Who Has Spent the Most Money On Their Campaign So Far? So when was advertising via the collective media first used in our political elections? In 1934, acclaimed author Upton Sinclair ran for governor of California on the Democratic ticket. His platform, known as the End Poverty in California Movement (EPIC) gained him the support of the Democratic Party. As migrants flowed into California fleeing the Dust Bowl the state's conservatives attacked him with propaganda, portraying him as a staunch Communist who wanted to overthrow America. Conservatives were so concerned about Sinclair's rising popularity that they hired an advertising agency to conduct a smear campaign - opening up the door for modern politics. California's newspapers (owned by Republicans) and led by William Randolph Hearst and Harry Chandler (LA Times), covered only incumbent governor Frank "Baldy" Merriam's activities, while mocking Sinclair day after day with quotes from books and novels taken out of context (sounds familiar today). Profiling two of the creators of the anti-Sinclair campaign - Clem Whitaker and Leone Baxter - upcoming writer Carey McWilliams would later call this (in The Nation) "a new era in American politics - government by public relations." He was right on in that accessment. 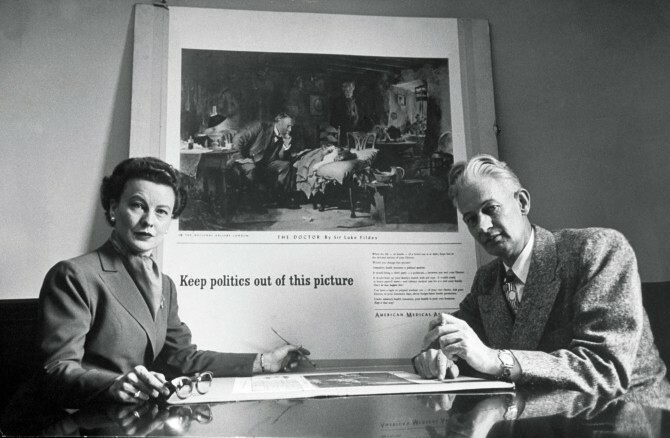 Whitaker and Baxter founded the first political-consulting firm in the history of the world in 1933. The New York Times called Sinclair's campaign "the first serious movement against the profit system in the United States." In the middle decades of the twentieth century, political consultants replaced party bosses as the wielders of political power gained not by votes but by money. Despite eventually losing to his wealthy and connected opponent, Sinclair would leave a positive literary and political legacy that has endured until today.